Manufacturers of medium and large VFDs typically provide information on the requirements for power cables connecting the variable frequency drive to the AC motor and from the VFD isolation transformer to the converter. Cable and panel grounding recommendations are also included. Cable supplier catalogs and Web sites provide detailed information, but not necessarily everything needed to determine if the VFD manufacturer's recommendations are being met. This paper provides typical requirements, reasons for those requirements, and some useful insights to help the reader bridge the gap between VFD supplier requirements and cable supplier published data. 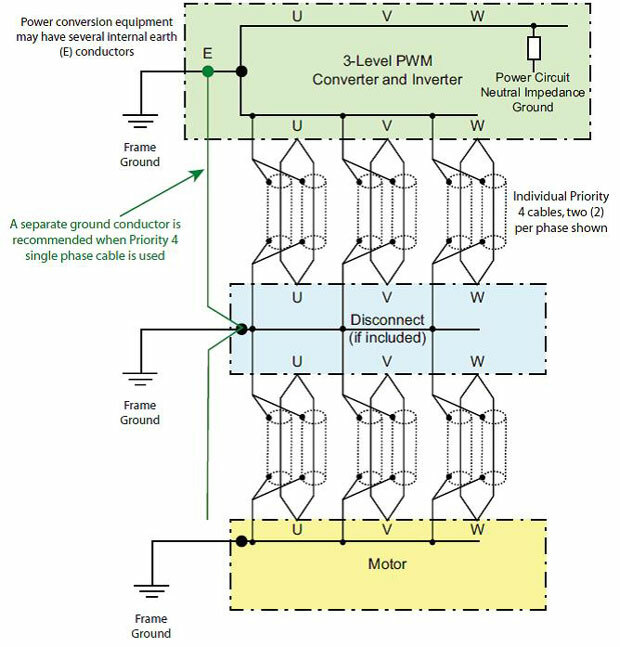 The availability of cost-effective thyristor- and transistor-based power devices made Pulse Width Modulated (PWM) power conversion practical. As is the case with most advances in technology, issues not seen in previous generations of VFDs came to light. These included motor insulation problems, bearing failures, interference with or destruction of existing VFD systems, and interference with unrelated plant equipment. Most, if not all, of these phenomena are attributable to switching speeds on the order of 10–100 times faster than the thyristors used in conventional DC power conversion. 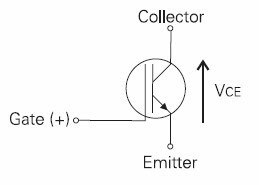 Thyristors are line-commutated devices; that is, a gate current applied when the device voltage is of one polarity causes the device to conduct current. Conduction is stopped when the AC line voltage polarity is reversed and the current is decreased to zero. The IGBT (Insulated Gate Bipolar Transistor), GCT (Gate Commutated Turn-off thyristor) and IEGT (Injection-Enhanced Gate Transistor) devices used in PWM power converters do not have this design limitation and are turned on and off by gate voltage or current.2 Power converters using these devices not only operate at high switching frequencies, but they also are independent of the incoming power system frequency. 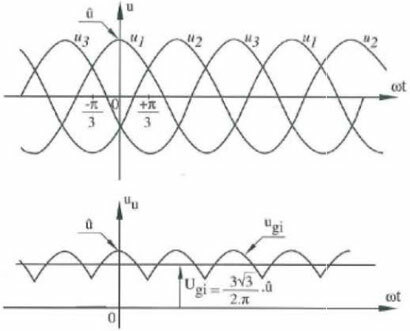 The resulting harmonics of switching frequencies are well beyond the fifth, seventh, 11th and 13th line frequency harmonics generally the concern when conventional DC drives are employed (Figure 1). The widespread use of PWM variable frequency drives in the 1990s and the early associated problems referenced above required new cable types not generally available at the time. VFD and cable manufacturers conducted tests of various cable configurations, resulting in various recommendations and the availability of new cable types. The introduction of additional harmonic currents in the equipment grounding circuits. Common mode currents require proper grounding to avoid premature bearing failures. Cross-talk between adjacent motor circuits. It should be remembered that PWM variable frequency drives are also often applied as converters, converting AC to DC for use by the inverters, which then supply variable voltage and frequency power to the motors. Therefore, similar cable recommendations also apply to the transformer-converter circuit. Equipment Grounding Circuits - The analog regulators and power conversion equipment of the 1960s and later required separate ground circuits for proper operation. 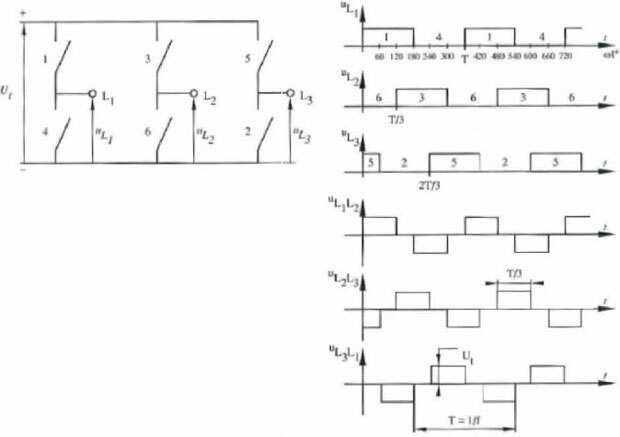 With analog signals as low as 5 V, offsets of a few millivolts difference between the various control platforms could cause hundreds of unwanted amperes to flow in the motor and generator circuits. Personnel Safety: Includes electrical equipment cases, motor frames and so forth. Control System 1: Ties all control circuit grounds within separate enclosures in a designated area. 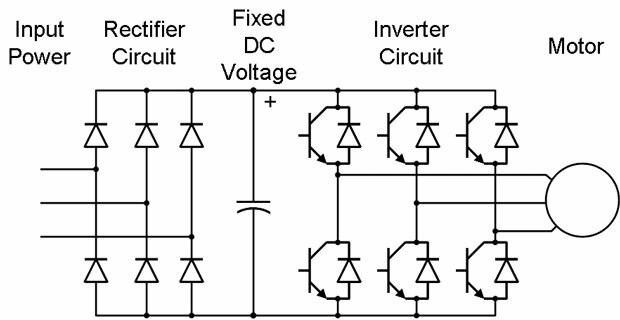 Power Conversion Equipment: Separate grounding circuits may be used for static power conversion equipment, depending on local codes and manufacturer. This may be tied to the Personnel Safety ground but not the Control System ground. Control System 2: Multiple control grounding circuits may exist, especially as additional lines are added to existing facilities. Control of Common Mode Currents - A simplistic view of common mode is that any difference in potential between two points will cause a current to flow through the path of least resistance. Since the potential difference can consist of many different frequencies, the mathematical solution can be extremely complex. The basic solution is to ensure that all potentials are equidistant to ground, with the path of least resistance determined by the installation to not be through equipment components that can fail due to unwanted ground currents. The primary concern here is that improper installation can introduce the motor terminals to much higher voltages than the insulation is design to accommodate. In addition, the path of least resistance to common mode current may well be the motor bearing, which generally shortens bearing life. In cases where both motor bearings are insulated, the path of least resistance may be passed to the driven equipment bearing. Note that sensors attached to the motor shaft, such as tachometers, must be properly protected to avoid their bearings becoming the path of least resistance. A related cause of high voltage at the motor terminals is the standing wave concept. 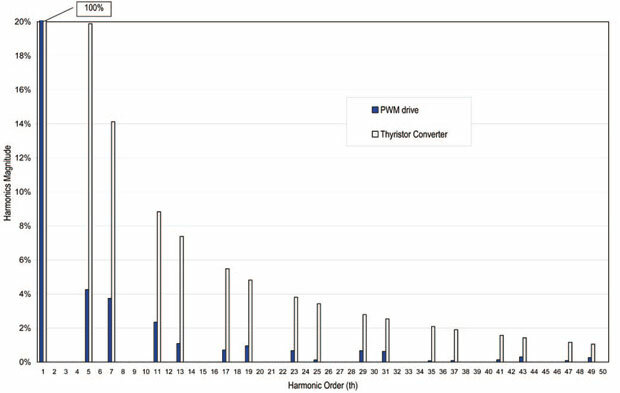 The combination of high device switching speeds and PWM control that allows a high-frequency string of voltage pulses being sent from the variable frequency drive can cause motor voltages many times nominal. For a particular cable type, there is some cable length that maximizes this voltage component. The PWM control algorithm can mitigate this issue. Circuit Cross-Talk - Physical separation of power cables and control cables is generally recommended by VFD manufacturers and may also be required by personnel safety codes. Multiple inverter-motor cables in the same raceway for long distances can have electromagnetic and/or electrostatic coupling. This could result in one system interfering with another's operation. Personnel safety is another concern, in that an individual may be doing maintenance on an un-energized power circuit that has voltage/current induced from an operating VFD. Electromagnetic coupling from power cables can also interfere with other equipment, such as radios, control circuits and instrumentation. Power cables between VFD isolation transformers and thyristor or diode converters follow the same guidelines used for DC drives. Special cable is not required. Three symmetrically arranged phase conductors. Three symmetrically arranged ground conductors. Individual phase conductor shields when RMS voltages above 2,400 VAC are recommended. The following cable configurations are prioritized from 1 to 4, or best practice to less desirable alternatives. Priority 1 Cable - The arrangement shown in Figure 2, when properly terminated, meets the above criteria. The cable does not introduce phase unbalance and minimizes high-frequency emissions. 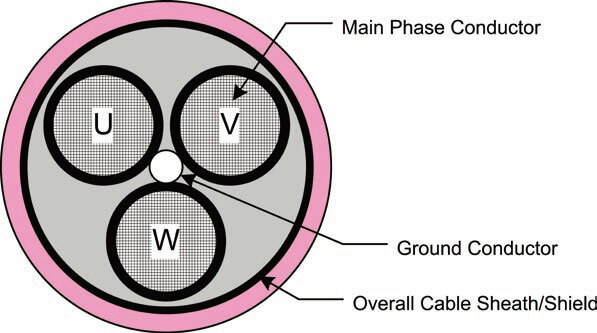 This cable type is designated Priority 1 because it results in the minimum common mode currents in the grounding circuit and minimum interference with other equipment in the facility. Continuous, welded corrugated aluminum sheath. Generally considered the best technical solution for grounding high-frequency emissions, it also provides very good mechanical protection and is sometimes referred to as "armored." This type is also the most expensive and difficult to install due to the rigidity of the sheath. Corrugated and longitudinally applied sheath with overlap. The material is usually copper and provides a good grounding path. The corrugated sheath flattens when the cable is bent, providing an unbroken sheath. Circumferentially wrapped flat copper tape with 133–150% overlap. The level of overlap ensures coverage if the bend radius is not too severe. Separation or gaps in the sheath allow some level of unwanted emissions. Weaved sheaths are found on some cables advertised as VFD. Weaves do not provide a 100% emission shield due to gaps in the weave. Priority 2 Cable - Priority 2 cable has a single, centrally placed ground conductor. Although shown for completeness and technically a solution, it has proved difficult to confirm that the ground conductor is centrally placed. 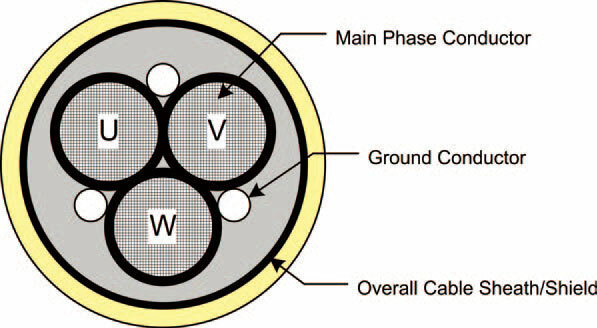 It seems to be more common for the ground conductor to be just one of four randomly placed cables in the bundle and not centered as shown in Figure 3. Unsymmetrical cable should be avoided. Priority 3 Cable - Priority 3 cable (Figure 4) has no separate ground conductor and relies solely on the overall cable sheath for grounding and emission control. 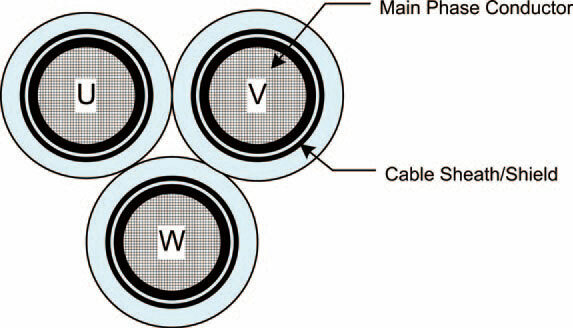 Priority 4 Cable - Priority 4 cables (Figure 5) have three individual cables symmetrically placed. In all arrangements, symmetrical main phase conductors are required to keep the phase currents balanced, with the goal of minimizing common mode ground currents and high-frequency emissions. Some manufacturers allow the use of Priority 4 cables when Priority 1–3 cables are not available. Special care should be taken to ensure symmetrical placement of the three single-phase cables. In the event Priority 4 cable is used, a separate ground conductor should be run in a separate path (conduit) to avoid the Priority 2 case of unbalanced electromagnetic effects. There will be phase unbalance with Priority 4 cables regardless of the care taken during VFD installation. Also note that since there is no overall three-phase sheath, all three individual cable sheaths should be grounded per the manufacturers recommendation. 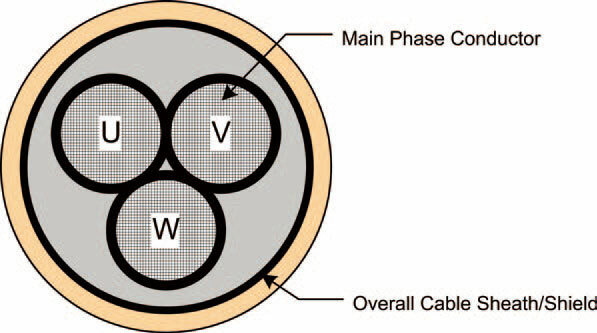 When multiple cables are required for ampacity purposes, each cable should contain all three phases, as shown in Figure 6 for Priority 1 cables. Cables are routed through buried conduits or placed in cable trays, or both. The ampacity de-rating rules recommended by the cable manufacturer should be observed. Should it be necessary to use multiple single-phase cables, there are two possibilities. The Priority 4 case can be followed, or the cable runs are placed in individual phase conduits to minimize common mode currents. However, this second case requires point-to-point buried conduit with no proximity to other power or control cables. In the case where cables are randomly run without regard to phase, cable sheath terminations may burn off due to excessive currents. In this case, the voltage driving the current is relatively high and may be considered a personnel hazard. All VFD cables must meet local codes and be rated for the RMS circuit voltage in which they are installed. Some suggested cable ratings available in North America are given in Table 1. Always refer to the equipment manufacturer's documentation for proper handling and installation, including grounding. 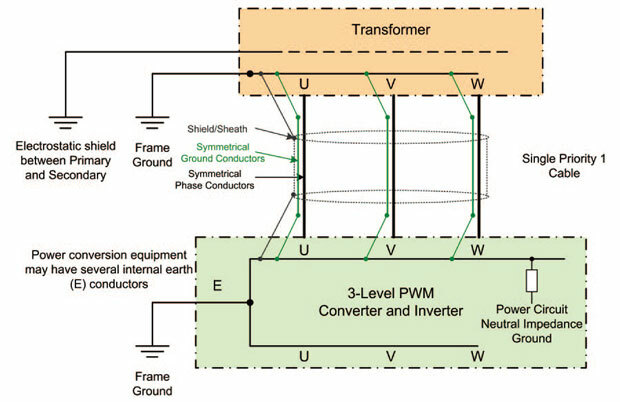 Figure 7 illustrates the grounding method for the case of a PWM converter connection to a transformer with a single Priority 1 cable. Note that the cable sheath/shield is grounded at both ends of the cable. The three symmetrical ground conductors are also grounded at each end of the cable. VFD isolation transformers are generally provided with an electrostatic shield between the primary and secondary windings which is connected to the system grounding circuit. The cable sheath/shield and ground conductors are also connected to the system grounding circuit. 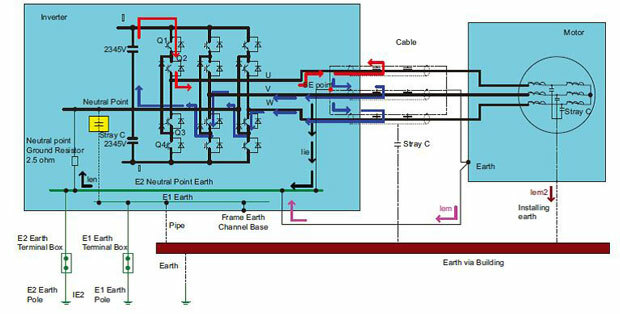 Converters are generally provided with an internal ground (earth) bus for cable grounding purposes, and perhaps a separate control ground bus. As noted earlier, separate external ground buses for control and power are not generally used in new installations. Therefore, all grounds eventually terminate to the same system grounding circuit, designated "frame ground" in Figure 7. In Figure 8, the variable frequency drive connection to the motor uses Priority 4 cables and includes a motor disconnect. This case requires careful grounding of the individual shields/sheaths, plus the separately run ground cable to mediate the common mode ground currents that this installation will incur. All cables used have the shield/sheath grounded at both ends. Again, please consult the manufacturer's documentation to confirm their recommendations. 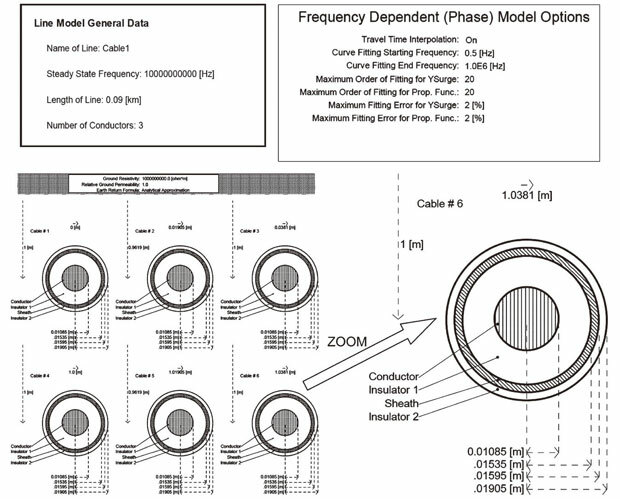 Note that Figure 8 does not attempt to illustrate the cable physical arrangement. Priority 4 guidelines are implied and should be followed. As an initial condition, all of the variable frequency drive output voltages are zero. The U-phase power devices Q1 and Q2 are turned on, applying +2,345 V to the U-phase output. Ground current flows as indicated by the arrows in Figure 9. When the motor load current is zero, the U-phase current flows from the U-phase cable through the sheath and returns to the variable frequency drive SE point. The current return to the variable frequency drive main power circuit is mainly through two paths. One path is the neutral grounding point, and the other through the V-phase and W-phase sheaths and cables. Figure 10 shows the ground currents Ias, Ibs and Iie as measured in the actual installation. The Ias peak current is 120 A with a frequency of more than 100 Hz. Simulation - A simulation was run using PSCAD/EMTDC version 3.0.8 to confirm the model against the field measurements. The parameters are shown in Table 2. When single cables are used in place of three-phase cables, the physical arrangement possibilities are endless. Since these tests were on a mill in Japan, we can be certain that care was taken that the Priority 4 guidelines were followed as much as practical. The arrangement for each phase might look as shown in Figure 11, with three single-core cables twisted as triplex sets. The cable model used in the simulation is shown in Figure 12. The simulation results are shown in Figure 13. The simulated ground currents Ias, Ibs and Iie are similar to the measured values of Figure 8, verifying the simulation results. Fig. 13 Results of the ground current simulation: (left) VFD ground currents and (right) other ground currents. 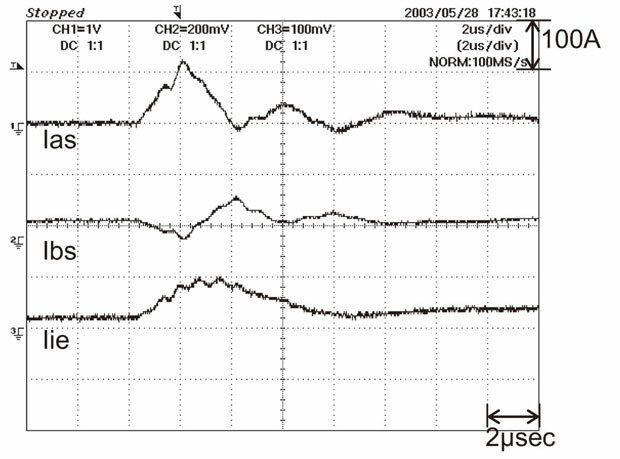 The ground currents Iem, Iem2 and Ien of Figure 9 were also simulated. The impedance to earth of the motor side currents, Iem and Iem2, is higher than the impedance to ground of the neutral point established in the variable frequency drive, and little or no current is observed. The ground path of the Ien and Iie currents are nearly the same, and so the simulated ground currents are practically the same. The intention of the neutral point grounding resistor is to control the ground current, so the simulation confirms the desired result. Keeping the unwanted currents within the variable frequency drive and cable sheaths mitigates the amount of unwanted electrical noise introduced into the plant ground grid. It is important to note that the cable sheath can carry significant repetitive pulse-shaped currents and must be rated and properly terminated to carry these currents. Differences in PWM VFD designs may result in different cable recommendations between manufacturers. In some countries, the recommended cables may not be available. However, the manufacturer's recommendations should be followed as closely as possible. Proper cabling installation of high-performance PWM VFDs will avoid interference with the operation of other plant equipment, as well as ensure proper operation and life of the connected equipment.